CDMCars.com is up and running! Make your car a vehicle for change . . . donate it to Central Dallas Ministries! The gift of your car, boat, plane or RV will help us in our work among the urban poor in Dallas and San Antonio, Texas. Consider making such a tax-deductible donation today. Help our efforts by sharing information about this opportunity with your friends who live in either city! Friends Matter, Friends Change Things. . . The report on the arrest of 31 undocumented workers at a warehouse in North Dallas that operated as part of the Fossil Watch Company caught my eye as I enjoyed my morning Cherrios a couple of weeks ago. I thought of the story again today in the aftermath of the defeat of the proposed comprehensive immigration reform bill in the U. S. Senate yesterday. What stood out to me as I read the story were the emotions reported among those apprehended by Immigration and Customs Enforcement (ICE) officials. Anxiety over children and their continuing care. As I read, I found my mind running back through many experiences with specific friends from Mexico--you know, people with unique faces and their own names and families-- who do not possess the documents they need to remain in the United States. These good people find themselves under increasing pressure due to stepped up enforcement by ICE officials who are taking steps that over the past 15 years or so very rarely have been chosen. It is obvious to me that the political situation is driving the new approach on the ground. I thought of what I experienced among my friends. But, also, honesty, hope, dreams, pride, self-respect, hurt and a desire to carry their own weight and to make a solid contribution to our community. It is the emotional side of this struggle that won't let me forget it. My friends and their families matter to me. My friends should not be placed in jail for a civil offense of this sort, at least not until those who employ them and all who benefit from their labor are carried away to the same punishment. A place to shop for supper. . . I've said it before, but it seems no one is listening, at least not here in Dallas. So, I'll keep saying it: inner city neighborhoods and communities need high-quality, retail grocery shopping opportunities. We need nice, real, grocery stores--you know, supermarkets--like every other part of the city enjoys. And, we need them now, not later! Sounds fairly mundane, doesn't it? Actually, to the people who put up with the current situation, it is not. It is very clear to me that any community truly concerned about health improvement and public health outcome disparities will get busy building accessible, quality grocery markets in the low-income parts of town. Want to cut into public health epidemics like obesity, hypertension, cardiovascular disease, diabetes? then make nutritious food products readily available to everyone. "There is an emerging consensus among researchers and practitioners that conditions in the communities where people live--from local economic opportunities, to social interactions with neighbors, to the physical environment, to services such as local stores where people can buy healthy food--all affect health" (Healthy Food, Healthy Communities: Improving Access and Opportunities Through Food Retailing, Fall 2005, page 1). The current crisis evidenced by our nation's growing "grocery gap," or the widening access disparity between more economically viable communities and low-income neighborhoods when it comes to the availability of good grocery options, has been brewing since the 1960s. With the advent of middle-class, largely "white flight" from older, central city neighborhoods, developers and city planners turned their attention and almost all of their resources to suburbs, leaving low-income families to struggle with transportation challenges and limited, convenient food purchasing options. 1) Poor families endure poor diets because they lack access to places that sell decent quality, nutritious foods at an affordable price. 2) Poor folks are forced to opt for food products at corner groceries where prices are high, selection is limited and ending in diets high in fat, sugar and calories. 3) Middle and upper income communities in Los Angeles County have 2.3 times as many supermarkets per capita as low-income communities; predominately white communities offer 3.2 times as many supermarkets as predominately black neighborhoods and 1.7 times as many as predominately Hispanic communities. Other regional and national studies confirm similar findings for other parts of the country. 4) Corner grocery stores that dot the inner city can be as much as 49% higher than supermarkets, while offering a poorer selection of food products--very little meat and fresh produce, mostly processed and canned foods. 5) African Americans living in proximity to at least one supermarket are more likely to meet suggested dietary guidelines for fruit and vegetable consumption and for fat intake than their peers who live in neighborhoods without supermarkets. 6) New grocery supermarkets contribute to the overall economic health of neighborhoods and very often serve as catalysts and anchors for further community renewal. 7) Traditional market analysis typically undervalue inner city neighborhoods and their economic potential. National data cuts against inner city economic and retail development, whereas more careful local market analysis tends to "prove up" the viability of urban markets. 8) A classic mistake of much market analysis is to focus on average household income rather than total area income. In countless cases, total area income is shocking to researchers who dig more deeply into the community they are analyzing. 9) Low-income, inner city neighborhoods actually present major advantages to retail developers who will take the time to learn. These include density of purchasing power, limited competition, and an available labor force. 10) Most of the time we fail to recognize the "double bottom line" inherent in community-business partnerships. It is very possible to achieve a healthy financial return on investment and realize sustainable and substantial community benefit. More on grocery stores coming soon. . .
15% of the U. S. labor force is foreign-born. 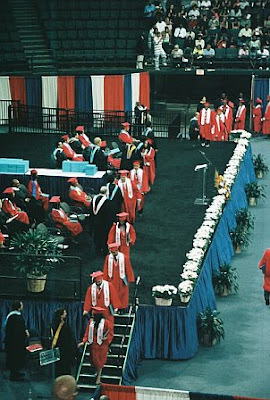 Immigrant workers account for 36% of all labor without a high school diploma. Immigrant workers account for 41% of scientists with doctoral degrees. Immigrants earn 77 cents for every 1 dollar earned by native workers, though this gap almost evaporates for those with college degrees. Over 90% of native workers benefit from the influx of low-wage immigrants because these workers take jobs that complement the work of higher paid native workers. For example, immigrants who work in the roofing business lower costs for contractors and home builders, who create jobs for plumbers, electricians and others, while lowering the prices for houses that benefit consumers. Some native workers who compete directly with immigrants may suffer in certain, unskilled labor areas, but not as much as they do thanks to other factors, such as technological advances, globalization and minimum wage levels. "There's this aversion to immigration, but people should be much more averse to computers. They are much more responsible for the bad effects." Does anyone think much about the plight, the personal plight of the undocumented workers among us today? The debate rages between two waring parties. On one side there are those who insist on immigrants from south of our border obeying our current, very inadequate legal provisions for allowing eager immigrants to secure legal work. On the other side are employers--large and small--who argue that we face a growing labor shortage in the U. S. that only these workers will and can fill. We all benefit from this labor supply because it keeps costs down for a growing number of consumer goods and services. Caught in the middle are real men, women and children. All have names. All have dreams, aspirations and hopes. Each one has an unique story worth hearing. But, we seldom hear these stories. As a consequence, we seldom pause to understand the human dimensions behind the current debate. 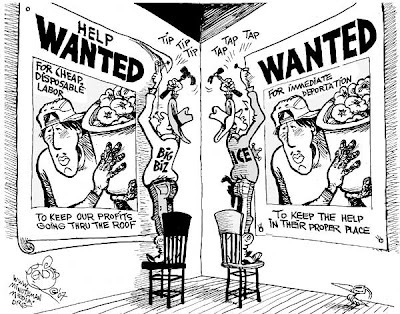 We choose to focus on law or labor instead of the people caught in the middle. The solution will be found when we turn our eyes toward the people. It is usually that way in life. And, in this case, there is something to be gained and won for everyone. Take the "law and order" folks. Monica and her family need to be provided a pathway to legal residency and, if they desire it, a process that ends in citizenship. It need not be careless or swift. It should require work, sacrifice and diligence--she and her loved ones would want it no other way. But, we need to find a way to allow the law to embrace them fully, as they step up to the process. Or, consider those who need unskilled laborers. Any reform should make it clear to employers that unfair wages--those below minimum--will not be tolerated. There is a cost of doing business and a price for the goods and services that we all use and consume. Flushing the underground labor market out into the light of day will serve everyone better. Employers or employees that don't abide by the new process should be punished, but the major responsibility should be on business, not labor. Good people like Monica and her family should not have to live in fear. Their ambitions and hard work should be rewarded. They should abide by the system and the process that is put in place. But, they shouldn't carry the entire burden of blame for our current situation, a situation we've all helped create. Border security should be addressed in a comprehensive fashion. That's a separate issue that must be faced and its challenges solved. But, Monica and her family are people, people caught in between. We need to start paying more attention to her, her family and to the millions of others who have served so many of us so well for so long. It's always about people and all people matter. The Ideal Neighborhood is among the poorest in Dallas. Last week, the city dedicated a strip of Bexar Street, running right through the heart of this community, where infrastructure improvements and a redevelopment plan are now underway. The Dallas Morning News published an op-ed essay written by Gerald Britt, Central Dallas Ministries' Vice-President of Public Policy and Community Program Development. If you are interested in urban renewal and community development, you should read what he wrote. Jim Wallis, author of a number of best-selling books on faith and social policy, including God's Politics: Why the Right Gets It Wrong and the Left Doesn't Get It, will be speaking at the Wilshire Baptist Church (4316 Abrams Road, Dallas, Texas 75214) on Tuesday, July 24 at 7 p.m. The lecture is sponsored by Texas Freedom Network, a non-partisan, grassroots organization of more than 26,000 religious and community leaders. Wallis is president of Sojourners and Call to Renewal, where he also serves as editor-in-chief of Sojourners magazine. The mission of each organization focuses on overcoming poverty and articulating a biblical call to the pursuit of social justice. Wallis is an excellent speaker. A capacity crowd is anticipated. The event is free, but advance registration is requested. Reserve your seat at http://www.tfn.org/ or by calling 512.322.0545. Prophetic messages delivered by prophet-like people make us squirm. We don't like "in your face" challenges, especially when they call us to task, suggest that we change and/or do things in a completely different way. "There is no dearth of Christian service today. But because much of it is service without prophetic compassion, it is powerless to bring about a radical change in individuals and society." Vishal Mangalwadi, quoted in "Cry Freedom", by Charles Ringma. Radical change forces us to work with compassion and imagination on systems, policies, processes, relationships and connections, rather than on individuals alone. Compassion without prophetic heart is not so hard, but very limited and very much of and about the status quo. Prophetic message without compassion is not very effective, and it gets heartless and angry and ends up being largely counterproductive. Marry the two and you discover a powerful energy for producing change. Again, not so easy, at times very dangerous, but so full of hope. Did you see USAToday on Wednesday (June 20, 2007)? A front page story on the mounting numbers of uninsured Americans reported that Texas leads the nation with right at 25% of us having no health coverage at all. Minnesota ranked 50th with a bit over 8% uninsured. The national average comes in at just over 15%. Texas: 25%! That is 1 out of every 4 people you see on the street, right? Maybe not. Depends on where you live. But, it is one of every four Texans--millions are children. When you factor in the costs of treatment in emergency rooms, lost productivity at work and school due to untreated illnesses and the loss of years of life, a well-documented fact among those who study such matters, you face a public health and economic crisis of the first order. Our state legislature just adjourned until 2009. While our leaders did restore some funding and applied reforms to our Children's Health Insurance Program, they obviously didn't do nearly enough. How long will it be before we wake up to the cost, the reality and the overwhelming need for a different sort of leadership and vision for our state. And, incidentally, I wonder which state has more churches today per capita, Minnesota or Texas? I think I know. What does this mean? How many people of faith who are also insured really care about this issue? As terrible as racism can be when expressed through individuals, we discover the more virulent and deadly variety embedded in public systems. Consider sentencing policies for the use of crack cocaine versus powdered cocaine. A year ago the American Constitution Society for Law and Policy published a "white paper" report by Nkechi Taifa that gets at this systemic, racist reality at work in our criminal justice system ("The 'Crack/Powder' Disparity: Can the International Race Convention Provide a Basis for Relief? ";May 16, 2006; http://www.acslaw.org/node/2859). The federal criminal penalty structure for the possession and distribution of crack cocaine is one hundred times more severe than the penalty structure relating to powder cocaine. Blacks comprise the vast majority of those convicted of crack cocaine offenses while the majority of those convicted of powder cocaine offenses are white. This disparity has led to inordinately harsh sentences disproportionately meted out to African American defendants that are far more severe than sentences for comparable activity by white defendants. Indeed, the U.S. Sentencing Commission reported that revising this one sentencing rule would do more to reduce the sentencing gap between blacks and whites "than any other single policy change," and would "dramatically improve the fairness of the federal sentencing system." Notwithstanding widespread recognition of the inequity of the current sentencing scheme, courts have found that domestic law affords no remedy. In this white paper, Nkechi Taifa examines that failure of U.S. law to address this disparity and explores ways that principles from the International Convention on the Elimination of All Forms of Racial Discrimination could form a basis for relief. People who continue to argue that racism is no longer a factor in American politics, culture, law or community relations are simply blind to a continuing reality. Systemic racism like that found in our sentencing practices remains unaddressed in our nation. The fact that these findings have been recognized for many years and that no remedial action to establish justice has been taken should be of urgent concern to everyone who desires fairness and justice in our nation. I witness the devastating impact of this unjust system on a daily basis, as our young men and women are "harvested" from our neighborhoods and sent to prison, rather than to treatment centers. 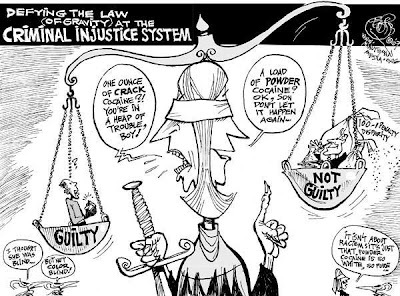 All the while, white offenders, whose drug of choice is the powdered form of the same narcotic, recieve very different treatment under the law based on race and/or economic status, power and privilege. Several years ago, an educator told me that the most efficient and effective way to see standardized test scores go up was to make sure that every child enjoyed a balanced, nutritious breakfast before taking any exam. I thought of that analysis recently as I read a report on a piece of British research about nutrition and prison behaviors ("Health food is the recipe for peace," by Marco Visscher,ODE, June 2007, page 80). Oxford senior research scientist, Bernard Gesch conducted research on the effects of good nutrition on social behavioral outcomes. In a British prison for youth offenders, the researcher divided 231 prisoners, all young men, into two groups. For a year-and-a-half, one group received food supplements that included the suggested daily requirements for vitamins, minerals and essential fatty acids. The other group received a placebo. No one in the prison knew who was getting which regimen. The results? Those receiving the more robust and balanced diet committed 26% fewer offences and 37% fewer violent assaults as compared to the group receiving the placebo. The study was designed to control for ethnic or social factors that might have affected the two groups and skewed the study. The obvious factor of influence on the outcome of the research project was dietary. Researchers couldn't help but ask a big "what if" about everyone in the study regarding their diet and nutrition while growing up. Eating properly seems to have some beneficial, determining influence on behavior. The study of youth offenders went on to report, regarding children, "There will be increasing evidence that young people are undermined by what they eat. There is not a diet yet that takes behaviour into account. In short: this is a societal time bomb." "There is an enormous increase in the number of prisoners, not only in Europe but most certainly in the United States. Research suggests that nutrition is a cheap, humane and highly effective way to reduce anti-social behaviour. We need to know more, or the composition of the right nutrients. It could be a recipe for peace." Helping provide nutritious food for children and adults is likely an essential ingredient in any plan to fashion a more workable and productive community. I expect we knew that already, but this study does provide fresh perspective. A detailed report on the research can be found at: http://news.bbc.co.uk/2/hi/health/2063117.stm. Former slaves rejoiced in the streets of Galveston. The next year Juneteenth celebrations began across Texas. All over the state freed African Americans pooled their funds to purchase land to accommodate the annual celebrations. Today the celebrations continue as a community tribute to the arrival of both the news of freedom and the actual beginnings of liberation. Remember freedom today. Find your own way to join the celebration! Yes, I ask people for money all of the time. But, a surprising thing has happened to me over the past 13 years in the city. I care less and less about the gift. When I say that my focus today is the giver, please don't hear me commending myself. I'm not patting myself on the back, not at all. There is just no other position to take in the matter if I want to sleep at night! Major wealth is a challenge and, I have come to believe for many/most people, at times a special burden. I find myself asking for money less and less often. What I am inquiring most about these days is the life of the wealthy person who expresses interest in what we are doing. Important questions, having nothing at all to do with what a donor may or may not decide to do for my organization, need to be posed to the very wealthy. As a new friend told me recently, "It is a grand time to be wealthy." That is certainly true from the standpoint of the growing wealth of the very wealthy in the U. S.
But, with multiplying wealth comes all sort of unique problems and specialized issues. Taxes are a huge concern for most mega-wealthy folks. Thus, the proliferation of the family foundation as a means of managing that special set of challenges. Many people create foundations to handle tax burdens, but have little if any idea as to what the mission of their foundation will be. Children as heirs is another gigantic concern for the very wealthy. The rich care about their children just as I care about mine. But the transfer of wealth to the next generation is not something that can be taken lightly. Parents worry about this significant passage in their lives and the affect it will have on the next and succeeding generations. We are all on a journey through life. My obligation, it seems to me, is to ask about the life stories, the dreams, the interests and the hopes of people--rich and poor alike. I've noticed when I communicate to a wealthy donor that I care most about his story, her journey, his hopes and her mission, our conversations turn inward and go deeper. These conversations allow space for "safe reflection" and processing along a path of personal and community growth. I've come to a place where donations just aren't the point. Shared life, authentic understanding and productive action as community is what the journey entails. Loving wealthy people is all about understanding and listening and really caring. Just like loving poor people. As has been true throughout the history of our nation, religion and values emerging from faith continue to play a significant role in shaping American politics and public policy. So, given the current national debate over immigration and comprehensive immigration reform, it seems logical that people of faith would turn to the Bible in search of insight and direction. The narratives of our faith tradition make it clear that the people of God have lived as immigrants and "aliens" in various strange lands. This fact largely defined the experience of the Jewish people in biblical times and beyond. Jesus spent time as an immigrant during his early childhood when his parents fled with him to Egypt. Conclusions? Here are a couple I've come up with. 1) God expects that "strangers" or immigrants be treated fairly, with compassion and justice. In fact, the faith of God's people is demonstrated by how they treat the outsider. Jesus once said, "I was a stranger and you welcomed me." 2) People of faith regard themselves as "aliens" or immigrants making their way through life and, as a result, should naturally identify with others who are living here far from their homelands. I'd love to hear your reactions. Cornell West is a hero. Everything he writes is worth reading and considering. On January 16 this year, West spoke during the Martin Luther King Convocation at Tulane University, where I spent a few years studying American History a long time ago. Wish I could have been there for many reasons. "Your self-worth is all about self-respect and self-confidence. About self-regard. About straightening your back. Walking. Taking action with courage and compassion, with malice toward none but with righteous indignation against injustice and unfairness." When people ask me what I do for a living, I often respond with, "Oh, I'm a professional beggar." My headstone should read something like, "Behold, the beggar died!" It is true. I spend a fair, and increasing, amount of my time asking people for money. With some of my friends it's become a real joke. A few years ago, I attended a Dallas Mavericks' basketball game with my good friend, Dan Hopkins. At halftime they blindfolded some poor guy, put him down on his hands and knees and the crowd yelled "hot" or "cold" depending on how close he was to another person wearing a sandwich board with "$500" printed on both sides. If the guy reached the "target" before the music stopped, he won the money. Dan turned to me after the guy won the money and asked, "Would you agree to do that?" I replied, "Shoot, Dan, that's what I do for a living!" He roared and has never let me forget it. Across the years I have developed an authentic respect for wealthy people, and not just because of our need for their financial support. The very rich face challenges that most of us never really think about, let alone come to understand. There is a special sort of burden attached to being wealthy. In fact, I've noticed across the years that the very rich often share more in common with the very poor than they do with the middle class. In some ways, in the case of the very rich and the very poor the "sky is the limit" as we say. The wealthy can do just about whatever they decide to do, though the deciding is the challenge. While the very poor, though certainly in no position to do whatever they desire, can realize great gains and receive real encouragement even in small steps because their circumstances are so open to improvement, but again, focus is a lively issue. The mega-rich worry about the next generation and the transfer of wealth and responsibility and the impact of all of that on children and heirs. The ultra-poor worry about their children, as well, but for much different reasons. Still, generational wealth and poverty share many of the same emotional dynamics. Many people of wealth and poverty struggle spiritually or theologically with what their personal economic position in life means about their own faith journey, purpose and significance. In many cases both rich and poor are more attuned to this thought process than many of us in the middle range. I've watched very wealthy people relate intimately and authentically, displaying great openness to what can be learned from the very poor. And, I must say, in a way that is often lost on many middle class folks who often come to "fix" things and to offer instructions about how things ought to be conducted. The very wealthy I've known seldom seem so conditional in their commitments to the poor, and the poor respond with friendship and appreciation that can be amazing. Stereotypes are never very useful. And, I understand that everyone is different. But, I've seen and felt what I am describing here. I need to think more about it. For now, let me simply say that it is intriguing to watch. Cutting poverty in half. . .
Just looking at the number is staggering. That's the number of Americans who live at or below the poverty line, a benchmark that is artificially low and out-dated. Millions more struggle to make ends meet each month. We don't like to admit it, and we seldom speak in these terms, but poverty is extremely costly, and not because we are over-funding programs designed to lift people out of it's grip. Lost productivity, declining public health, increases in criminal activity and broken neighborhoods combine to run up our national poverty tab. Childhood poverty alone (brace yourself!) costs us $500,000,000,000--that's $500 billion annually or about 4% of our entire GDP. Instead of making progress against poverty as a nation, the fact is that over the past six years five million Americans have fallen into poverty. Today, as you read my post, 1 of 8 Americans lives in poverty! The U. S. ranks 24th out of 25 developed nations when counting the number of persons who live on 50% of national median income. What does this say about us as a people? One thing is clear: economic inequality is growing among us. In 2005, the wealthiest 1% of our population received 19% of the nation's total income, the highest percentage since 1929. The poorest 20% of our population received only 3.4% of the nation's income. We must do better than this. Here's the really sobering fact: we could if we decided to. 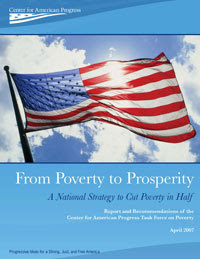 Last year the Center for American Progress convened a "Task Force on Poverty." The group ended its analysis by calling for a national goal of cutting poverty in half over the next 10 years. Setting forth a bold 12-step plan, the task force created an economic model for actually reducing poverty by 50% between now and 2016-2017. 1. Index the minimum wage to half the average national hourly wage. 2. Expand Earned Income Tax Credit and Child Credit benefits. 3. Encourage the health of unions by enacting the Employee Free Choice Act that would allow employees to organize more easily. 4. Guarantee child care assistance to low-income families and promote early education for all children. 5. Add 2 million new housing vouchers for use by families desiring to live in neighborhoods where poverty is not concentrated in an unhealthy and defeating manner. 6. Connect disadvantaged youth to school and work. 7. Simplify and expand Pell Grants and make higher education accessible to everyone. 9. Provide Unemployment Insurance benefits to low-wage workers who are excluded by the formulas and process of the current system. 10. Improve, modernize, increase efficiencies and coordinate public benefits so that people in need can access what is needed for people who find themselves between jobs and for the disabled among us. 11. Reduce the high cost of simply being poor, and increase access to legitimate, equitable financial services. 12. Incentivize saving for education, homeownership and retirement. The task force estimates the annual cost for these recommendations would be approximately $90 billion a year. For sure, a significant investment in our nation's future and present health and well being. But, only 0.8% of the nation's GDP--less than a 1/4 of what the present existence of poverty currently costs us! In 2008, tax cuts for families with incomes over $200,000 will cost the nation $100 billion. The Urban Institute estimates that by implementing just 4 of the recommendations (minimum wage, Earned Income Tax Credit, child credit and child care services) poverty could be driven down by 26%, over halfway to the goal! Such progress would mean over 9,000,000 fewer people living in poverty and a national poverty rate of 9.1%--the lowest in our history. Child poverty would dip by 41% and the number of people living in extreme poverty, or about 1/2 of the federal poverty level, would drop by 2,000,000 Americans. The poverty gap among the races would narrow significantly. White poverty would drop to 7%. African American poverty would fall from 21.4% to 15.6% and Hispanic poverty would fall from 21.4% to 12.9%. Public will is what is needed. Lots of people won't believe it is possible, but it is. Our history proves it. In the 1960s, U. S. public policy managed to almost eliminate poverty among our elderly citizens, thanks to the creation of programs such as Medicare. Other ingenious initiatives combined to drive poverty down by almost 19%. At that time another war intervened to distract our national attention and truncate efforts to further reduce the impact of poverty among our people. No program will be perfect, but the choice between perfection or nothing, is not a legitimate way to frame the challenge. We can do better work than we are today. And, I'd say, we must. 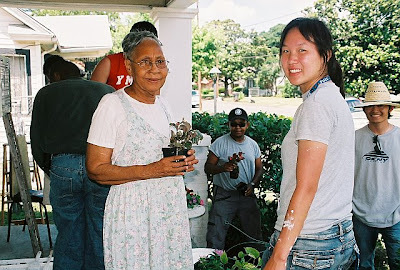 Thanks to the One Star Foundation, the Texas expression of the Corporation for National Service, earlier this year Central Dallas Ministries landed a large AmeriCorps grant that has allowed us to place almost 150 community workers out in the community. As noted in an earlier post here, on Saturday before last we inducted 113 of our summer AmeriCorps staff. These energetic young people spent the day working together in one South Dallas neighborhood as their kickoff for the summer. Thought I'd post a few photographs from the day. Anyone interested in understanding the current immigration debate raging in our culture, in the U. S. Congress, and closer to home here in Dallas, ought to read Robert Draper's informative and extremely personal essay published recently in Texas Monthly ("Made in America," May 2007, pages 146ff or on the web at: http://www.texasmonthly.com/preview/2007-05-01/feature3). Draper's essay is especially helpful in providing some historical perspective on immigration and our southern border. Draper tells the story of Vicente Martinez, an undocumented Mexican laborer who crossed the border and ended up as one of the key hands and horse trainers who worked on the family ranch owned by his grandfather, none other than Houston attorney and former Watergate special prosecutor Leon Jaworski. Martinez came to the Jaworski's ranch at Wimberley, Texas in 1969, "long before 'illegal' was a dirty, demagogued word." Three years later Jaworski saw to it that Martinez's pregnant wife and three small sons were reunited with the hard-working husband and father on the ranch. Draper's tale is moving, amusing, down-to-earth and personal. Thirty-five years after the family was reunited on the ranch, all are productive, legal residents of the U. S. The Martinez children, all three boys and their younger sister, are well-educated and successful, thanks to the determined sacrifice of their father and mother who came here for one reason and only one reason: to give their children a better life. Draper's point is clear: the outcomes for millions of immigrants like the Martinez family are good for everyone--the immigrants and the nation. What was true thirty years ago, we should expect to be true today. To his credit, Draper doesn't gloss over the injustice or the exploitation bound up in the American immigrant experience, especially for Mexican workers. One of the reasons why I find the current "conversation" about comprehensive immigration reform so ugly and disingenuous is its blatant hypocrisy. While there are a few voices in the current debate arguing on behalf of American labor, the fact is, with or without immigrant laborers, the weakened labor movement in the U. S. is of little concern to most people. Consumers want low prices. Period. Concerns for what labor may suffer to deliver the goods at the lowest price possible are minimal at best among most of us. Undocumented immigrants have always worked for less than other American workers. It has been their sacrifice that has kept prices down for all the rest of us in industries we depend on and take advantage of thoughtlessly: housing, dining, service, landscaping, housekeeping, etc. I can understand the outcry of organized labor against the current system. But, as I say, most opponents of reform are not labor activists! There is undoubtedly a racist undercurrent at work in much of the anti-immigrant sentiment we are hearing these days. Draper makes it very clear that we are all implicated in the "illegalities" of the current situation, just as was the case with his grandfather. Turning all of the fury, the rhetoric and the animosity against the undocumented worker demonstrates the worst sort of our nation's hypocritical denial. "I have seen men who have done better, and so has Vicente. They were my grandfather's friends: lawyers, judges, newspaper publishers, oilmen. During hunting season, they would roll up to Circle J Ranch in their Cadillacs and Lincolns, driving on smoothly paved private country roads, past rows of immaculately carved heart-cedar-post fences--all the handiwork of Mexican migrant workers. A member of the Texas Rangers often showed up to my grandfather's ranch and casually observed the laborers at work. It's fair to say that the Ranger did nothing to discourage the activity, just as friendly immigration authorities had done Royce [the man who transported the family out of Mexico] the favor of turning the other way when he drove Vicente's family into America in 1972. The civic titans of Texas who visited my grandfather's ranch were aware of what was going on. Men like these saw to it that the border, and the laws governing it, would remain a joke. "These men would shoot their hunting rifles all day long and then sit under the stars and drink while Vicente plucked the turkeys or skinned the deer. The men admired Vicente's old-world comportment. The keenness in his stare, the sureness of his grip. They comforted themselves with the belief that the Mexican seemed to find even lowly work ennobling, and they would tip him well. And the next morning they would go home to their mansions, whose lawns were tended by other uncomplaining Hispanic gentlemen, each of whom would probably be doing this type of work forever so that his children would not have to. "That was the catch in Vicente's voice I was picking up on at his dinner table. He was not an idiot. A horse trainer, attuned to the elemental, he knew condescension when he saw it. And he knew that, though the opportunity here was far superior to the choices he faced in Mexico, he was not getting paid what a white man might. Both sides understood that this inequality--made possible by the transaction's unlawfulness--was key to the deal. Because of the cheap labor offered by migrants of modest yet unsinkable ambition like Vicente Martinez, men of means but not of obscene wealth could afford fine lawns, fine ranches, loyal domestic help. And a man like my grandfather could buy thirty broodmares and a stud, churn out foals, and then rely on a Mexican trainer horse whisperer to transform each unruly baby into a poised nine-month-old commodity. Hay, tack, barn equipment--the horse operation would ripple through the economy in a variety of ways, and no one would be hurt by it. "Men like Vicente were the straws stirring the drink. Yet men are what they were--bored and lonely, with families down south. They had but one chip to play: I accept my lot if you will help me give my children a better one" (page 290). The story is partly disgusting. The story is extremely sad. Mr. Martinez endured exploitive injustice and blatant racism at his work. At the same time, he exhibited the very qualities we champion as ideal in every corner of this nation: heroic, sacrificial, courageous, parental devotion. I find it very difficult suddenly to regard Mexican immigrants, coming to this country seeking only a better life for their children, as the culprits in our current immigration chaos. Hard-working folks willing to make sacrifices for their families--sorry, but that sounds an awful lot like the stuff of classic American mythology to me. And, why focus such hostility and punishment on them now? They come seeking what the generation before sought and the one before that. Dismissing their contributions out of hand--current and historic--as insignificant and inconsequential, we now must appear to be arbitrarily changing the rules of a game we've all been playing for a long, long time. We need to get real. We need to face the facts. We need to get beyond the racism. Most of all, we need to work together for a fair and just solution that will include the 12 million-plus undocumented workers and their families who are here today and, if we are wise, will be tomorrow. The Dallas Morning News published the first of a two-part, front page series in yesterday's paper ( "Where are they all going to live?" ). Part two runs today ("Jump-starting change"). The subject: a crisis of affordable, workforce housing in our growing city. The report is worth reading for anyone who cares about the development of adequate housing in any urban area. latestnews/stories/061007dnentapt_overview.2e85b2c8.html. You can find the second part on the paper's website today. The challenge of providing adequate housing stock for the expanding population of a growing urban community like Dallas is enormous and requires a courageous public commitment to be successful. Political will, creative leadership, various, often complicated funding tools and the willingness to do the right thing for the entire community, no matter what the political consequences, are all essential ingredients to any successful housing strategy. Deals take too long--one of our largest, mixed use, mixed income projects that we are planning to build in East Dallas has been underway for over 5 years! The frustrations have been incredible and daily. Only non-profit developers like us will have the patience to stay with deals like this one, and the jury is still out on whether or not we will actually close into construction. Every project is enormously complicated from a financial standpoint. Layer upon layer of financing of various kinds are involved in all of our projects. Pre-development funds are scarce. Interim financing is complicated and permanent financing at the conclusion of projects is never easy or certain. Public involvement, usually essential for any successful project, is almost always a struggle to acquire and requires lots and lots of patience and determination. If and when it arrives, it is generally too little to assure a deal's success. Timing presents many challenges. Acquiring and holding property is difficult for non-profit developers in areas where for-profit companies just don't want to work due to the number of challenges that are not present in easier-to-develop, suburban areas. Marketing and property management services that are necessary to lease up projects and operate them in a high quality manner also add costs to projects that often come to market on razor thin profit margins. Just recounting a few of the most common hurdles we face in attempting to bring high-quality, affordable housing to our market makes me wonder why we stay at it! Of course the answer is people, our neighbors. The report makes it clear that the economy of the entire community depends upon the continued and increased development of housing stock for our growing workforce. A couple of important facts surfaced in the first part of the housing report. Both are extremely troubling. First, 42% of Dallas households are "cost-burdened,' that is they pay over 30% of their income on housing costs. That's an amazing number, especially in a city that is tearing down thousands of affordable units and replacing them with upscale, expensive homes, condos and luxury apartment developments. Second, the current trend lines for median income and home values are not good news. Median income here in Dallas in 1990 was $27,469 with the median cost of a home at $78,300. By 2000, income rose to $37,628 and home values were up to $94,456. In 2005, median income actually slipped to $36,403 while home costs continued to rise to $120,900. For things to change in Dallas, and especially in our inner city neighborhoods, free market forces must be supported by public plans and policies that make new development possible and feasible. At the same time, affordable housing units need to be built all across the community so that low-income persons do not continue to be segregated in the Southern Sector of the city. Tom Leppert or Ed Oakley will be elected as our new mayor next Saturday. I hope they are reading these reports and paying attention. To be really relevant and effective our next mayor will need an aggressive plan to challenge our current very negative situation and to overcome it with bright new designs for our next generation as a city. Walter Isaacson just published a new biography on Albert Einstein, Einstein: His Life and Universe. "His slow ability to learn how to talk meant he thought in pictures. He thought in images. He thought imaginatively. 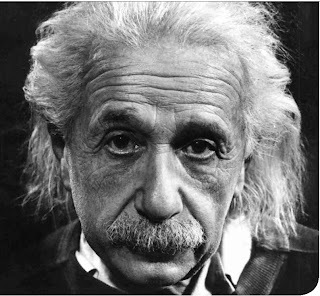 All the great Einstein breakthroughs are not done by really hard applications of hard mathematical equations but by imaginative thought experiments." It works this way in every field, it seems to me. Progress occurs, breakthroughs happen when people are allowed to see new visions, dream new dreams, work on new ways of looking at old problems and experiment with their understanding of reality. While there may be security in the "hard math" approach, advances come when we allow ourselves and our partners to "see" the future and its ever expanding possibilities. This Saturday, thanks to the hard work of our AmeriCorps members and the support of the youth members of the Preston Road Church of Christ, we are going to host our first-ever "Second Saturday Sale." Proceeds will benefit Central Dallas Ministries. This effort is our beginnings of building a "social enterprise" department at CDM. You will be hearing more about this strategy in the future. Central Dallas Ministries' 2nd Saturday Sale! Did we mention shirts? Polo, dress, scoop and v-neck, sleeveless, 3/4 sleeve, colored, Hawaiian type, stripes, work/Dickey, faded…Austin, Wilson, MUDD, Lee and more brands! We will also have TVs, bed frames, mattresses, bedroom sets, sofas and more! HOW: Just show up and shop! We also accept donated goods on site, so feel free to show up with your donations for CDM. See ya at the sale! The poor and what we pay for. . .
A couple of recent news reports captured my attention pretty quickly. Last week I heard the CEO of a major U. S. oil company interviewed on NBC. His particular company, not really a very large one, had seen profits rise annually from a beginning point of a bit over $4 billion in 2003 to almost $16 billion in 2006. When asked about the rising price of fuel in the U. S. today, the very nice man started down the road of supply and demand. He also threw in the claim that Americans, despite rising prices, continue to drive and demand more fuel. The fact that the price of a barrel of crude oil sells today for about $10 less than it did a few months ago doesn't seem to be doing anything but continuing to drive prices up. Something seems a bit out of whack to me. How about you? The last time I filled up, I paid $3.15 per gallon. I wonder what % of their profit margin is being directed toward alternative fuel research and development? Jeremy Gregg, our Director of Development, sent me some information about the impact of rising fuel costs on other consumer goods. Jeremy's point was to have me consider the effect of such a reality on the poor and their families. Then there was the little side bar report about a new initiative put forward by Brazilian President Luiz Inacio Lula da Silva to provide very inexpensive birth control pills for the benefit of family planning among the poor in his country. Under the plan, 10,000 drugstores across Brazil would make the a year's supply of the pills available to low-income people at a total annual cost per person. . .are you ready for this???. . .of $2.40! The President said his plan would give poor Brazilians "the same right that the wealthy have to plan the number of children they want" (The Dallas Morning News, Tuesday, May 29, 2007, page 6A). Sounds like a good effort. But, look at that price! I'm I missing something? I'm wondering, can someone convince Brazil to tell us where to buy our pharmaceuticals as a nation? Or, could it be that the price is tied to the government's power to purchase in such mass quantities and directly from the manufacturer? Again, just wondering about solutions to the practical problems we face here every day. 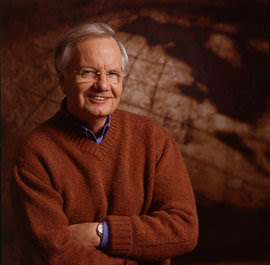 Bill Moyers presented the commencement speech for the Southern Methodist University Class of 2007 on May 19. What follows is just a section of his poignant commentary on life in the USA today, a big part of the world every graduate will face as they move out with their lives. Let me see if I can say it a different way. A moment ago, when the reunion class of 1957 stood up to be recognized, I was taken back half a century to my first year at the University of Texas. In my mind’s eye I saw Gilbert McAlister – “Dr. Mac” – pacing back and forth in his introductory class to anthropology. He had spent his years as a graduate student among the Apache Indians on the plains of Texas. He said he learned from them the meaning of reciprocity. In the Apache tongue, he told us, the word for grandfather was the same as the word for grandson. Generations were linked together by mutual obligation. Through the years, he went on; we human beings have advanced more from collaboration than competition. For all the chest-thumping about rugged individuals and self-made men, it was the imperative and ethic of cooperation that forged America. Laissez faire – “Leave me alone” – didn’t work. We had to move from the philosophy of “Live and let live” to “Live and help live.” You see, civilization is not a natural act. Civilization is a veneer of civility stretched across primal human appetites. Like democracy, civilization has to be willed, practiced, and constantly repaired, or society becomes a war of all against all. Think it over: On one side of this city of Dallas people pay $69 for a margarita and on the other side of town the homeless scrounge for scraps in garbage cans. What would be the civilized response to such a disparity? Think it over: In 1960 the gap in wealth between the top 20% of our country and the bottom 20% was thirty fold. Now it is 75 fold. Stock prices and productivity are up, and CEO salaries are soaring, but ordinary workers aren’t sharing in the profits they helped generate. Their incomes aren’t keeping up with costs. More Americans live in poverty – 37 million, including 12 million children. Twelve million children! Despite extraordinary wealth at the top, America’s last among the highly developed countries in each of seven measures of inequality. Our GDP outperforms every country in the world except Luxembourg. But among industrialized nations we are at the bottom in functional literacy and dead last in combating poverty. Meanwhile, regular Americans are working longer and harder than workers in any other industrial nation, but it’s harder and harder for them to figure out how to make ends meet…how to send the kids to college…and how to hold on securely in their old age. If we’re all in this together, what’s a civilized response to these disparities? America’s a broken promise. America needs fixing. . . .
Not as an empire. Or a superpower. Not a place where the strong take what they can and the weak what they must. But a Beloved Community. It’s the core of civilization, the crux of democracy, and a profound religious truth. But don’t go searching for the Beloved Community on a map. It’s not a place. It exists in the hearts and minds – our hearts and minds – or not at all. Back in April at our annual urban ministry prayer breakfast, we hosted the top seven Dallas mayoral candidates in a public forum. We asked each of them to tell us what they intended to do in response to the growing needs of our fellow citizens who struggle daily in poor neighborhoods, especially in South Dallas and the Southern Sector of our city. It was an interesting morning attended by about 1,200 people. Included in the morning's program was a "testimony" by Wyshina Harris, a member of our staff of community builders. Wyshina works in the public housing development where she lives. She does great work in our After School Academy located at Turner Courts. 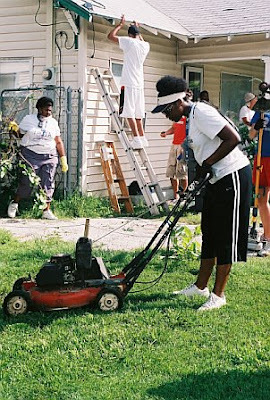 She is working every day to make her neighborhood better for everyone. Her powerful words need to be heard, not only in Dallas, but across the nation. Here's what she had to say to the candidates and the large audience that was present. My name is Wyshina Harris and I am a resident of South Dallas. I have two kids--a 10-year-old daughter and a 5-year-old son. I want South Dallas to become a place where I don't have to worry about my kids' safety every day. We see violence and drug dealing all around us. We hear gunshots fired regularly. My kids still get scared when they hear the gunshots. I don't want my kids to get over being scared of that. Kids aren't supposed to get used to hearing gunfire outside their front door. There are as many liquor stores as churches in South Dallas. I'd like to see that change. We need a decent grocery store, clothing store, and gas station. It's hard to travel all the way to North Dallas to buy a decent pair of sneakers for my kids. My kids go to H.S. Thompson Elementary. When people outside of the neighborhood find out where my kids go to school, they say, "Oh my gosh. You let your kids go to school there?!" Well, what's my alternative?! That's the neighborhood school. I can't afford private school for my kids. Our school needs good teachers and counselors who will fight to get kids on par with their grade level rather than sticking them into slow learning classes. We need resources to enable our kids to learn technology and to explore the arts. We can't allow our schools to set our kids up to fail. I will tell you that there are a lot of things that need fixing in our neighborhood. I will also tell you that there is a lot of hope and a lot of strength in our neighborhood. I think sometimes people think that people in poverty are just too lazy to pull themselves out. That isn't true. My neighbors talk to me about desperately wanting to find work and wanting to go to school to change their lives. We want the same things for ourselves and our children that you want for yourselves and your children. I'm not giving up on South Dallas. I ask that you not give up on South Dallas either. We don't need a handout. We need authentic, impactful partnerships to help us solve these issues. I don't share this with you today because I want your pity. I share this because I want your partnership. I want to work with you, and with the future mayor of our great city, to make Dallas a better place for all of us. 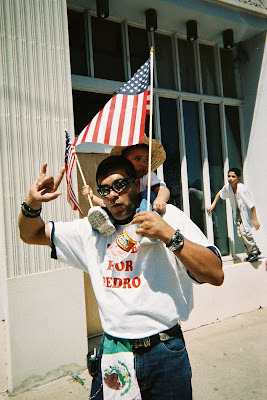 My take on the current immigration debate continues to be shaped in large part by my experiences and relationships with some incredible friends who live here without proper documentation. In my view, we need immigration reform so that my friends can "get legal" and remain in the U. S. The debate going on today in the U. S. Senate ought to be shaped in large part by the stories and the lives of the people who will be affected by any new legislation. I've told Monica's story here in some detail in the past (just search "Monica" to refresh your memory or understand more). Monica has been living in Dallas since she was 5-years-old. 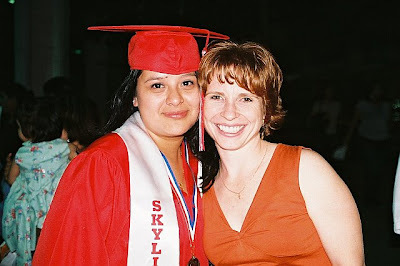 This year she graduated from Skyline High School! She is a good student and a great person--exactly the sort of person we need in our community. The picture of her graduation ceremony with her class is a testimony to her hard work and to the quality of life she enjoys in her home. Her parents are hard working people whose home is so full of love that no one escapes it without health, hope and prospects for a bright, bright future. Unfortunately, due to recent events, Monica may be deported to Mexico later this year. She has an immigration hearing set for August 1. Last week I accompanied her, her sister and her cousin to the Dallas office of member of the U. S. House of Representatives, Eddie Bernice Johnson. Our purpose was to determine what, if anything, the Congress woman could do to help Monica. As Monica answered all of the questions that were asked of her, I felt tears welling up in my eyes. So honest. So straightforward. So authentic. So exactly what this nation needs. Representative Johnson will write a letter of support. That's about all she can do. One of her assistants advised us to pray that the judge would exercise discretion and mercy in the case. The immigration debate is personal for me. I know Monica and her family. As a result, I know what needs to be done. A comprehensive immigration reform bill needs to be passed so that Monica and people like her and her family can remain in the U. S. and continue to help it be a better place in which to live. Just ask Dr. Janet Morrison, Director of Children's Education here at CDM, pictured here with Monica. She'll tell you the same thing. Pray for Monica, her cousin, Jose and their great families. Did you watch the "debate" earlier this evening (Monday) organized by Jim Wallis and Sojourners and hosted by CNN? As I asked in my post early this morning, if you watched, what did you think? I'd like your impressions of the first hour and then, for those who continued to watch, the next hour of interviews with the other major Democratic candidates. The subject was politics, faith and poverty. Let us hear what you thought! Concerned about faith, values and poverty as we move toward the next national election in 2008? You may want to tune in to CNN at 6:00 P. M. (CST) this evening for a special "Presidential Forum on Faith, Values, and Poverty," to be hosted by Soledad O'Brien. Broadcasting live from George Washington University, the forum will involve the three leading Democratic candidates for President, Hillary Clinton, John Edwards and Barack Obama. The forum will take place during Sojourners' annual Pentecost 2007 conference. I am very pleased that the event will focus the candidates and the entire process on the poor and the challenges they face in our nation today. 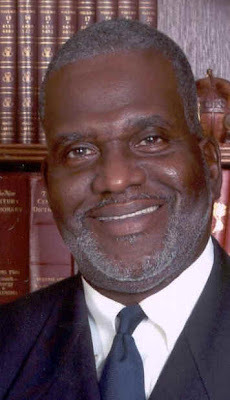 Joel C. Hunter, senior pastor of Northland Church in Orlando, Fla. The hour-long forum will be a first-of-its-kind special edition of the "Situation Room." The special forum has been organized by Sojourners and Call to Renewal. A similiar forum is set for the Republican candidates for President in September 2007. I hope you'll tune in this evening. If you do, please let me know your impressions. "Unjust laws exist; shall we be content to obey them, or shall we endeavor to amend them, and obey them until we have succeeded, or shall we transgress them at once?" I say that you cannot administer a wicked law impartially. You can only destroy. You can only punish. I warn you that a wicked law, like cholera, destroys everyone it touches -- its upholders as well as its defiers. Thanks to our AmeriCorps funding, Central Dallas Ministries has been able to place members (the number noted parenthetically) at each location listed above for the summer. These bright young men and women will be assisting in all sorts of community building endeavors while earning a modest living stipend and an educational award. In addition to these 113 members, CDM has an additional 32 full and part-time members who are working at our locations throughout the year. AmeriCorps, CDM style, is working in some amazing and very creative ways all across our community! I'm grateful to our director, Keven Vicknair for the leadership she provides this wonderful team of dedicated community developers! 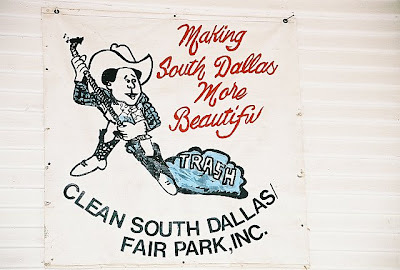 This morning at 9:00 a.m. we swear in our summer members in a ceremony at the headquarters of Clean South Dallas! It will be/was a moving and inspirational moment. All week these dedicated young people have been involved in intensive training. Their work this summer will make our city better and the experience will prepare them for lives of making a big difference. I am so proud we are involved at such a grassroots level. "So, do you believe in Jesus?" Lots of people who visit Central Dallas Ministries ask us, even after a two-hour tour, "So, where does the ministry take place?" Or, "How do you work the ministry into your programs?" By that they mean where and how does "the call to conversion" or the invitation to "accept Jesus" come into play in what we do. We are a faith-based organization. So, I try to explain that we consider everything we do to be "the ministry part." 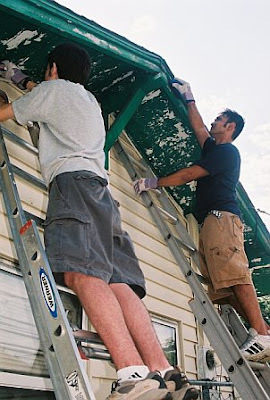 Whether it is providing food, housing assistance, legal counsel, medical and dental services, pharmacy benefits, after-school programs, employment training, technology education, community organizing and leadership development, counseling services or the activities of the Central Dallas Church: it is all "the ministry part." Many church people believe that the most important thing, for many the only thing, is to get to "the eternal salvation" issue as quickly as possible. "How do you witness to Christ?" is another way the question is often put to us. Often I will try to explain our approach by quoting Saint Francis of Assisi, who once said, "Preach the gospel at all times. Use words only when necessary." The fact is, we tend to approach our neighbors as the embodiment of the Jesus whom we follow. We take Jesus seriously when he said that whatever we do with and among "the poor," we actually are doing with and to him. We believe that we meet him in our encounters with the hurting, the excluded, the prisoners, the homeless, the sick, the hungry and the immigrant stranger. Why would we be too concerned about asking these friends of ours if they believe in Jesus when it is clear to us that they bring him to us? Yesterday, Dan Hopkins (my good buddy and board member of the Central Dallas Community Development Corporation) and I were running out at White Rock Lake early in the morning. As we cut through a wooded area, a man emerged from the trees. He obviously "lived" among the trees. We greeted him and stopped to take a breather as we visited with him. He really wanted to talk. So, we spent a few minutes hearing his story. In the course of our conversation we explained to him that we had some new apartments to offer folks who had no place to call "home." I gave him our contact information, and he said he would call. As we finished our run, Dan said, "I've noticed that you never 'hammer' people with the Jesus speech. You don't lead with 'Do you believe in Jesus?'" Reflecting on his comment as we continued our run, it hit me, in spite of my oxygen deprivation, that the most important question is not, "Does John believe in Jesus?" The real question is, "Does Larry believe in Jesus?" Answered correctly, that question gets us much further down the road to the kind of world we really want to build. Because if I do believe in Jesus and if I take him at his word, I will never pass by a guy like John, nor will I dismiss people from my life who are broken or in need or strangers or marginalized or different than I. "Larry, do you believe in Jesus?" Yep, that's the right question. As I think about my brief meeting with John, that was exactly the question he was asking me. Oh, he didn't put it that way in what he said. But, it was written all over his face and his life circumstance. It was as if in his story and presence, Jesus emerged from the woods at the lake to ask me where I was really headed with my life. Oh, and just for the record, John called me yesterday morning. We're working on a housing plan, among other things.